Introducing Mixcraft Featured Artist of the Month, Sandra Szabo, solo artist and lead singer of Sandmarx. A/k/a TheRocketQueen90 on YouTube, Sandra has over 68,000 channel subscribers and has uploaded over 150 songs with over 11 million views! Sandra Szabo on Spotify exceeds 1 million streams. This Guns n’ Roses, Avenged Sevenfold, Halestorm and Foo Fighters inspired Norwegian-Hungarian born singer-songwriter was born in Norway to Hungarian parents, went to school at UC Berkeley, moved to Brighton UK where she attended BIMM (British and Irish Modern Music Institute) and currently resides in Norway. Having browsed through your extensive catalog of videos and songs, you have such a diverse collection of acoustic, electric, solo and band material. While we do not have enough time and space to delve into your all of your musings, let’s focus in on your new single “Ghost Away”, which will be featured on your upcoming album. Ghost Away is rock anthem-ish, vocals and harmonies are passionate, performances are tight, production is clean, dirty and big, but perhaps the most captivating part of the song are your lyrics. Can you tell us how you came up with lyrics for this song and all of your songs? Sandra: Thank you so much for interviewing us as artist of the month! And thank you for noticing the lyrics, that’s something a songwriter appreciates! Lyrics are such a cool and strange thing, sometimes every word comes to me in 10 minutes while other times I spend a year finishing it. Normally the songs I write are about things I see, feel and experience myself, but I can get inspired by almost anything, and as long as it makes me feel something I get this urge to turn it into a story. Many of my songs have a deeper meaning, which is important to me, but mostly I just want to make my listeners feel good. “Ghost Away” tells a story that I’m sure many people relate to. It’s about finally managing to let go of something that’s been haunting and hurting you for a long time… stuck in your mind, just not letting go. How it’s been making you feel angry, lonely, weak, sad, strange, all of these things! I truly believe art and music can help anyone get through a rough time, it’s what I call the magic of music. By turning my own feelings into words and songs, I always feel a lot better, and this is what “Ghost Away” is about, slowly erasing the pain and letting go of those negative thoughts. Why did you choose Mixcraft 8 Pro Studio as your go-to DAW? Marcus: Mixcraft is the software I always use when I have to do anything with audio - I've been using it for 10 years, it all started with a trial of Mixcraft 3. Each new version has come with new awesome features and Mixcraft 8 Pro Studio is just a fantastic tool. I think what separates Mixcraft from other DAW's is the combination of how easy it is to just start doing simple stuff like recording and tracking, together with all the possibilities that the bundled instruments and effects bring for more serious engineers/producers who want to dig deeper. Also, I've only had to contact support once, and they were super nice and helped me really quickly. It's super easy to add 3rd party VSTs, and the ones included in Pro Studio are great. Pianissimo virtual piano (a Steinway emulation) sounds amazing. Does Mixcraft come into play with regard to the songwriting process and pre-production? Sandra: Absolutely! We always record demos of our songs before the actual recording process starts. It is very useful to test early ideas and effects with Mixcraft. Marcus: Yes! Almost all songwriting for me happens with Mixcraft - recording ideas, trying different instrument parts together, testing effects and hearing how the stuff in my head sounds. The Ghost Away mix sounds ferociously dangerous. What effects did you use on the vocals, instruments and master tracks? Sandra: We use the Classic Compressor, TB Parametric Equalizer, and Acoustica Pro Studio Reverb a lot. For the main vocal track, we always start with these three effects. The Acoustica Pro Studio Reverb sounds so amazing and is very easy to handle to get the perfect reverb. We also use the automation feature to get that increasing reverb or delay effect to make some places extra interesting. The solo has some of the Acoustica Delay, and for the bass we used the Studio Devil Virtual Bass Amp to get that powerful bass sound. 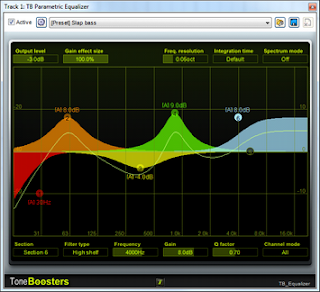 Marcus: TB Parametric Equalizer and Acoustica Pro Studio Reverb go on so many of the tracks. That Reverb and EQ makes it a breeze to just notch out some frequencies here and there and remove unwanted low end and so forth. TB Gate is also great for drums to isolate the sound we want. And every guitar solo has a touch of the Acoustica Delay. On the master track, we use a free 3rd party plugin called Limiter6, which has RMS compressor, peak limiter, high-frequency limiter, clipper, true peak limiter, and a TB Parametric EQ just for some polishing. If you would like to take a closer look at Mixcraft 8, please visit www.acoustica.com for more details or download a free trial. Thank you for visiting Anthony’s Home Studio.